When you want an expedited and/or inexpensive design/build process, just tell us you want basic or minimal design. Some design phase work is still required, but we can often design simple treehouses without scheduling a site visit. You are responsible for a little bit more this way because you may have to send us a few photos of your tree(s) and give us some measurements. But if you are willing to do some of that leg work, then we can often give you a free estimate for simple, basic treehouses. This process usually works out fine for most basic small to medium residential kids tree houses. We often will show you what your treehouse will look like by showing you pictures of other treehouses we’ve built over the years rather than by creating custom artwork for your tree house design proposal. When to Choose the Basic Tree House Design Process? If you have a modest or fixed budget for the tree house and you want all of your money to go towards tree house construction (materials and labor) rather than for site visits, computer or artistic tree house design services, or engineering costs. If you are a long distance from us and a site visit would be rather expensive. If you don’t mind taking some pictures of the tree house site and taking some measurements for us. If no building permit is required for tree house construction. If a building permit may be required, but you choose not to pursue one AND the neighbors either can’t see the tree house from their land or you have asked what they think of your plan to build a treehouse in specific trees and they do not raise any objections. Remember that nearly all tree house related township disputes start because of a disgruntled neighbor alerting authorities. If you love the pictures in our tree house portfolio and trust us to create something that you will like, so you don’t feel the need to spend a lot of time planning all of the design details. Complete Tree House Design Services: A more thorough tree house design process. A better approach to visualize what you will get ahead of time or if you need engineering or drawings to submit for permits. This should be considered essential for commercial projects or when our very best quality is more important than the project budget. Learn how to build a treehouse from us at one of our upcoming workshops! This is the best way to learn the principles of treehouse construction and then design your own treehouses. 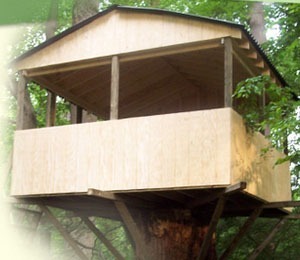 Contact us if you are ready to start designing your custom tree house! Tree House Design Home: Read more about designing tree houses. If you looking for as much free advice as possible (don’t feel bad, you’re not alone here 🙂 then you may learn more about tree house design here (the treehouseguide.com). Good Luck!